Last week, I introduced you to the “Line in the Middle Feed” Queen (missed it? Click here). 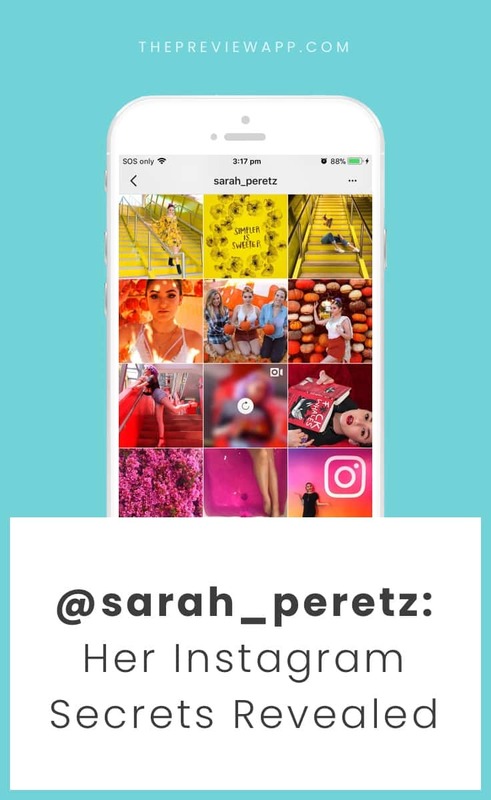 Today, let me introduce you to the Rainbow Feed Queen: Sarah Peretz. 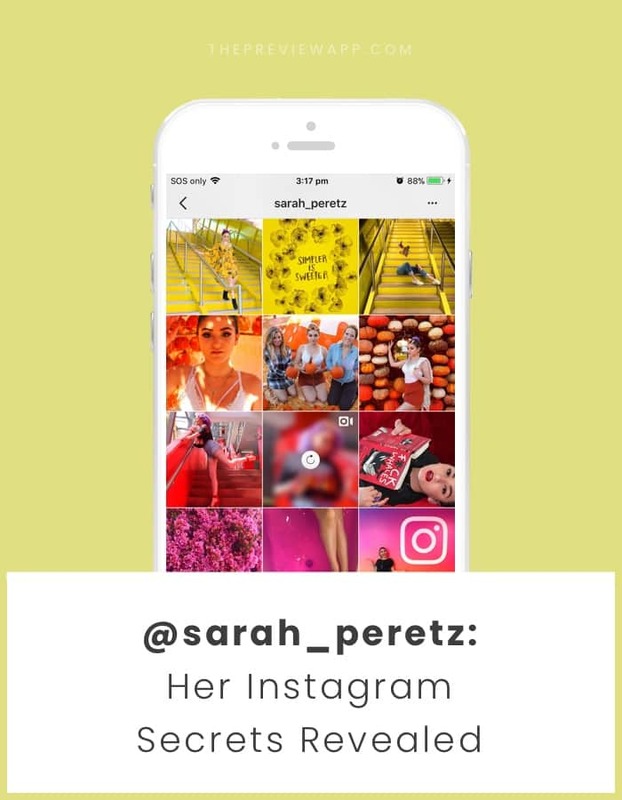 You might know her from Snapchat or you might have seen her beautiful feed in almost all of our blog posts, guides and videos. She is one of the fastest-growing influencers of our generation and one of the most highly-regarded artists. If you haven’t seen her art you need to see it now. She only uses her iPhone and fingers! Insane. We are so happy to bring you Behind her Instagram feed. If you’ve ever wondered how she edits her photos, plans her feed and grows online (and offline)… you are in the right place. Thank you to everyone who sent their questions for this Behind the Feed interview. We hope you’ll enjoy it! 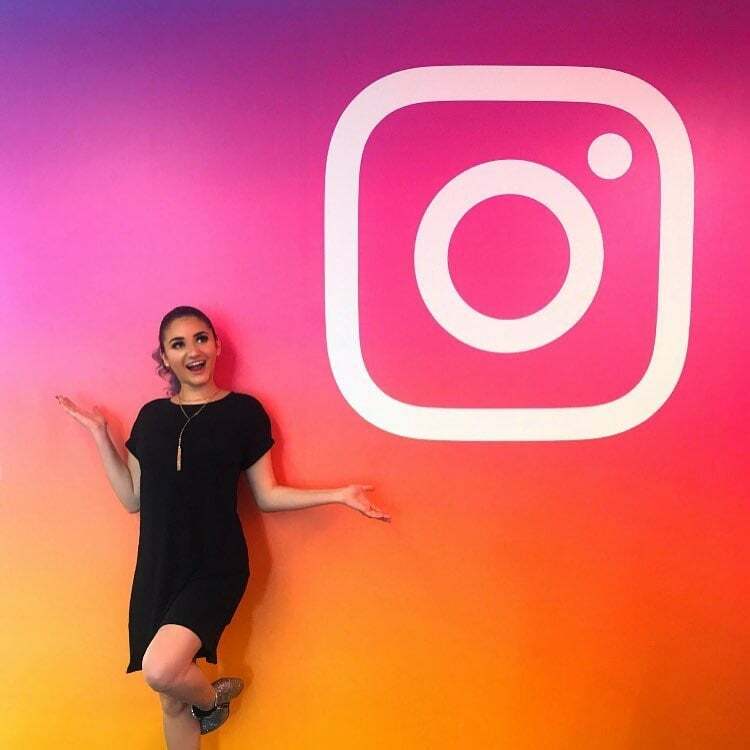 Here she is, the Rainbow Instagram Feed Queen, ready to share with you her secrets to making the perfect feed and growing on Instagram. Hello Sarah! Before we start, while you need no introduction, can you please introduce yourself to everyone? Who are you, where are you from and what do you do? Hey there! 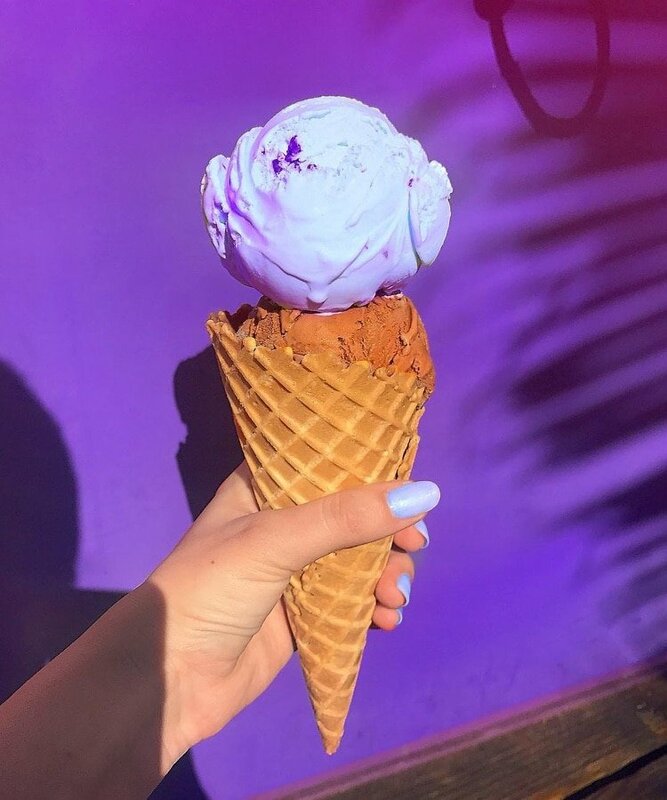 My name is Sarah and I’m a Los Angeles-based color-loving Instagram creator! Online, I focus on helping people grow, develop their brands and better understand the tools they have to work with. Offline, I’m a social media consultant. I work with other creators, brands, and entertainment companies such as movie studios and record labels with their own growth and social campaigns. I also help social media platforms with future features and improving current ones! How is life going at the moment? WOO! Life for me right now is crazy but good! Living in LA and working as a contractor means things are always changing. You never know what the next job will be, how long it will run, and where it’ll take me! What are you up to these days? Are you working on some fun things? A lot of fun stuff! I’ve recently finished working on a project that had me traveling for 21 days of last month, which was wild. I had the pleasure of working from 7 locations all over the globe and even got to fly (literally) around the world in 6 days. After finishing that up last week, I’m now in San Francisco for meetings with a few very cool companies including… Instagram! Let’s talk about the elephant in the room: Your Instagram theme. What inspired you to start a rainbow theme? There was a good chunk of my childhood where if someone asked me what my favorite color was, I’d say “rainbow!”. I’ve always loved how colors blended together. Last year I found Michelle Phan’s Instagram (@MichellePhan). 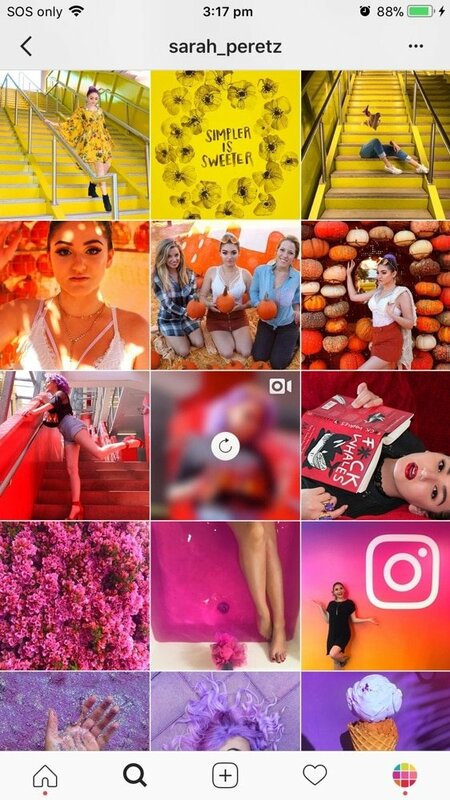 Her posts from April 28 – December 25, 2015 inspired me to bring my love of rainbows to Instagram. Is it hard to take photos to match your theme? Oh heck yeah! When you start a color-oriented theme, everything becomes a scavenger hunt for your color – even trips to the grocery store! Finding a match is even harder, so I often resort to Photoshop to help me out there. Talk to us about how you take your photos. Do you shoot in the next color you need for your page or do you edit the colors in later? How do you find the right colors in your environment to maintain this feed? Do you actively seek out photo opportunities that match the current/next color of your feed? Or do you take photos in no particular order and then plan the posts accordingly? I try to shoot as organically as possible. A few times I tried to post a color I had edited to a different hue and those didn’t go too well. You can probably tell which ones when you go through my account! And yes! I’m actively on the lookout for colors that will match my theme. I really try to keep an eye out for the next 3 colors in my theme. Living in LA helps a lot. We have great walls (never thought that would be a perk!). But environment can be a big hurdle when I’m traveling. What apps do you use to edit your photos? And which one helps you change the color in the photo? For easy and quick editing editing on my phone, I’ll use Enlight! I’ve gotten really used to the platform and can push out my edits in 2 minutes or less. That said, it does cost a few dollars ($4 USD and ranges in other countries). But for people who want something for free, I recommend Picsart which will also allow you to change colors and has similar tools to Enlight. When I want my edits to look perfect, I’ll use Photoshop CC on my computer. It always gives me flawless results even though it takes a little more time. Do you find it hard to stick to your theme sometimes? Of course! I can’t tell you how many times I’m traveling or doing something fun with friends in the moment and I can’t post a pic because it doesn’t match my theme. My workaround has been posting a set a photos in a carousel. Real talk: Your hair is goals. 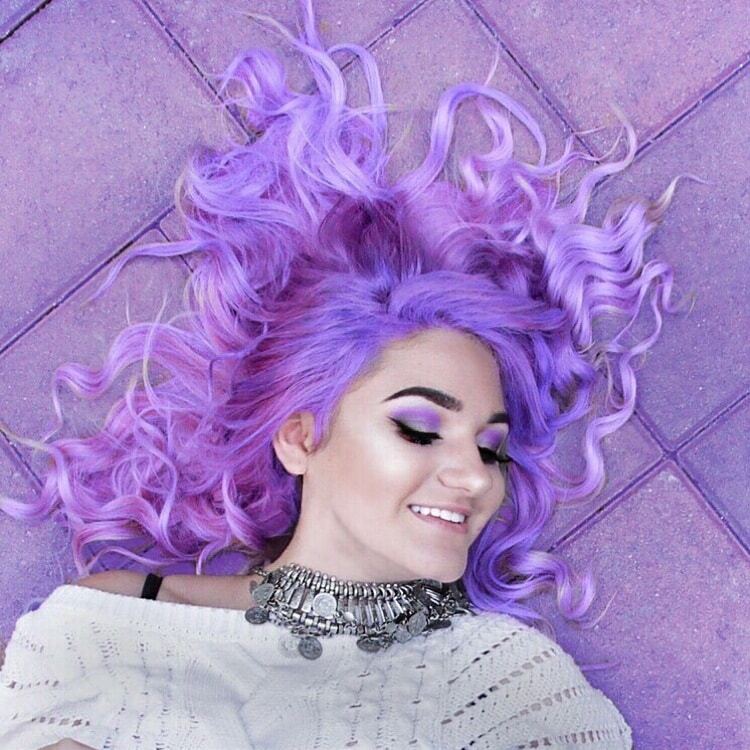 Do you dye your hair to match your theme? Or do you edit it? Whoa thanks! My purple hair started when I turned 20 in 2016 (before I even started my theme!) and kept for a little over a year. 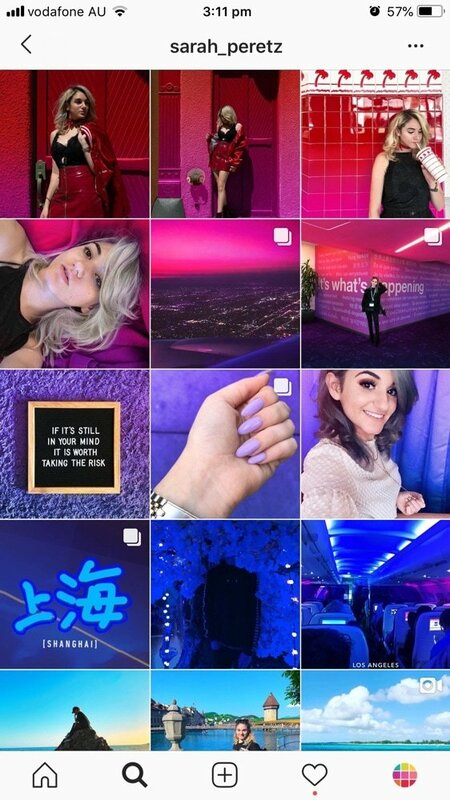 It made purple photos super easy, but upstaged posts in any other color. I recently gave full creative control to LA-based stylist @illhuesanddos who’s taken me between cool silvers and summery blondes. These colors have been super easy to shoot with! In terms of editing, I try to keep it minimal unless my hair is pulling colors from the light source. Ok, now let’s talk about how you plan your Instagram feed. Everyone wants to know: How do you transition between the colors so smoothly? My gradient transitions have only started recently! Gonna preface this one with a big ol’ #NotSponspored! The absolute only reason I can achieve my transitions is through Preview. I literally have a month’s worth of placeholder photos and transitions lined up. Once those are in place, the biggest challenge is matching my edit to the placeholder in Preview. Could you do a Youtube video on how to maintain your rainbow feed? Because everyone who tries to do that fails. Do you set a time aside to plan your feed? Or do you just plan it whenever you feel like it? You know those nights when you lay in bed wondering where your life is going and if it’s all just downhill from here? Those are the nights 😂. My Instagram planning is part of my life planning. And if that sounds crazy, it’s because it is. I think it’s so easy to get into a rut when you’re scrolling through your feed and you see old classmates living these crazy lives, celebrities blowing your entire college tuition on a mindless impulse-buy and seeing gorgeous places you never think you’ll go. I don’t just plan my feed colors, I plan my feed content. When I drop a placeholder-photo into Preview, it’s a goal I’m setting for myself. How far in advance do you plan your feed in Preview App? How long does it take to plan your feed design? Anywhere between 15 – 30 minutes. Most of the time I’m adding placeholders. When I’m back and forth between edits and making sure they match my theme, it can take 10 minutes or so. Do you write your captions in advance or on the spot? Oh gosh, haha I should really focus more on planning my captions, but they’ve been pretty much on the spot for as long as I can remember. Do you post at a particular time for more engagement? I’ll use insights to help tell me when’s a good time to post, but I also try to be mindful of my international audiences. Everyone is on a different time zones. I tend to get more engagement when I post between 9-12 PST (both AM and PM). Have you ever wanted to switch themes? I would say yes, but my themes weren’t really “themes” at the time. @MrDoodle! He’s an extremely talented, UK-based artist with and an incredible mission. Such a kind heart and so devoted to his work. You are so successful on Snapchat and now you are growing your Instagram too. Based on all your online experience so far, what do you think are the top 3 most important things you did that helped you grow your audience? Anything else you would like to say to everyone? Any tips? Thoughts? The floor is all yours. Make it as long or short as you want. Find passion in what you do and don’t be afraid to take risks. My social presence, success in my work, press and everything in between were all from a series of risks backed by passion. Some of those risks were really stupid, others were calculated. But if you take a leap, make sure it’s worth it. If you’re genuine and work at it, you’ll grow. Social is all about striking a balance. All you need is a plan. I’m still in my planning phrase and it’s been so much fun to learn as I grow and discover my social identity. That’s it! Where can we find you? Thanks so so much for having me!